A wonderful quote that easily applies to the life of the ERA team. We’ve seen the escape room industry grow from its infancy in North America to its current status as one of the hottest new trends for team building, entertainment, and social outings. It should therefore come as no surprise board game designers and producers are trying to figure out how to get these experiences inside your home. Welcome to Escape Room: The Game, one of the latest board game offerings designed to introduce (or further satisfy) those wanting an escape room experience without leaving their home. This box is no ordinary board game however. With a purchase of this product you receive four separate game scenarios inside. Each sealed package contains one of Prison Break, Virus, Nuclear Countdown, or Temple Of The Aztec. Prison Break is the first recommended scenario of the four games provided within Escape Room: The Game. Although you don’t need to start with this scenario, we did find Prison Break to be the easiest entry point as the puzzles and overall difficulty were easier than the others. It’s also important to preface that most of the ERA team in Toronto played through the scenarios, but each of us walked away with a very different perception of the overall game experience based on our personal likes, dislikes and focus… Having said this, let’s take a look at Prison Break! The component quality was the first of our debates. The timer, code detector, and cipher device (aptly called the Chrono-Decoder) was incredibly fun to interact with. Without providing any spoilers, it’s safe to say you’re going to enjoy the anticipation of inserting keys into the box and waiting for confirmation if you got the right combination. On the other hand, the game pieces and in particular the game board for this scenario were quite small, hard to read, and frustrating to work with at times. I was fairly happy and satisfied with most of the components none the less. And the puzzles? I enjoyed them also! 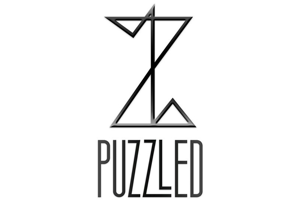 Again there was much debate as to how enjoyable the puzzles were among us… I felt the puzzles did a great job of bringing real escape room style puzzles into a board game context. 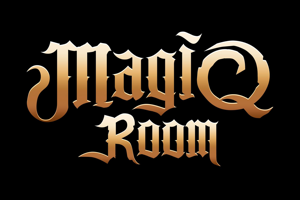 Those looking to get a general sense of what an escape room feels like without visiting an actual escape room company may find this to be a worthy replacement. Other ERA members felt there was a lack of creative puzzles and story connecting their significance. The hint system is unique and well managed in this game. Timed hints are provided at your discretion via hint cards that are inserted into a ‘red screen decoder’ to read. This means you’ll never ‘accidentally’ see them (we know there’s one of you in every game group). The hints are directive but not to the point of actually revealing the answer. This allows the satisfaction of still working on and solving the puzzles based on your own merits. One of my favourite features about this scenario however was that the puzzles were inclusive and involved everyone in our group of four. Most escape room board games (and escape room companies) have a tendency to design puzzles that only one person can interact with. This leaves most groups at the whim of the most aggressive and/or dominant personality and therefore only fun for very few people… Team builders and those who enjoy doing things together will appreciate the puzzles in Prison Break as much as I did. The immersion is sadly one area we all agreed upon… it’s rough. We wish there was a bit more focus on story development throughout the game. Many story based board games are starting to enter the market nowadays. People are coming to appreciate the value of a good story, with a compelling introduction, an engaging unfolding, and a twist you didn’t see coming at the end. Prison Break unfortunately didn’t provide in these areas. Where it does provide for immersion however is in the neat app you can download to get some ambient sound in the background. We found it didn’t work properly at times, but the idea is still cool and when it was working provided some of the missing immersive context we craved while solving puzzles. Last but not least the overall game experience. The final debate among us… We had a wide range of strong opinions on this one. Some weren’t satisfied, some were neutral, and yours truly really enjoyed the overall experience! Now was it the best board game experience? No, but in my opinion it captured the essence of an escape room and did a really good job of providing an in-home escape room experience. The game box accurately recommends three to five players which is perfect for a small group of puzzle and escape room enthusiasts who enjoy bonding around a board game… However, those wanting a fully immersive escape room experience or more engaging story will probably want to pass on this scenario. Virus, the second game in the Escape Room: The Game box, centres around several scientists trapped in a lab with a mysterious deadly substance. The game board itself is beautifully designed and detailed, though somewhat small and flimsy. It will take some squinting to see all of the bits and pieces scatted across the board. The component quality is not something meant to last through the years, which is completely understandable for a one-time-play game. I would definitely recommend this game to be purchased individually; it is not a game for a cafe that is designed to serve hundreds of customers. To involve four or more players in puzzle based gameplay is not an easy task, but the way Virus pulls it off is incredibly pleasant. Open-ended gameplay shines throughout the experience, and teamwork really builds through the hour. One thing Escape Room: The Game does really well is bring the experience out of the game board by incorporating aspects of reality. One drawback of Virus was a specific puzzle that was vague, cryptic, and lengthy to solve. This puzzle was supposed to be a precursor to an easier puzzle that we solved by trial-and-error, which let us proceed through the game without completing all the puzzles. Aside for that one game-flow design choice, the puzzle design in Virus is enjoyable, creative, and inclusive. The story of Virus unravels as you progress through the game. The soundtrack brings a unique depth to the game, and the pressure and excitement of the escape really pull you in. Unfortunately, there is no conclusion, and instead you are presented with minimal explanation and a few disappointing red herrings, which had much more potential. Characters are introduced then forgotten, and their motivations are barely existent. The story builds itself up only to plateau, so it still feels like a lacklustre victory when that final trumpet blows. The game experience was exciting and fun, as any escape room should be. The Escape Room: The Game box really lets you bring home an escape room experience more than any other board game I’ve played. Like many real-life escapes, the game is more focused on puzzles and teamwork than story. 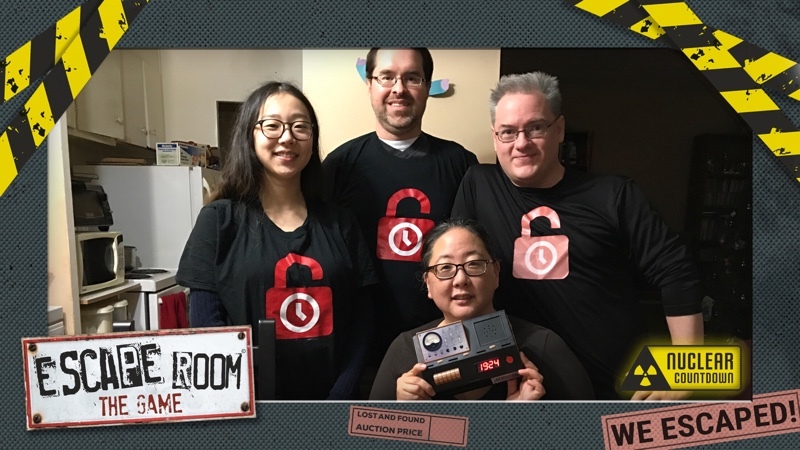 Other escape room board games have felt like a cross between an escape game and a role-playing experience, and brought many things that could not be duplicated in a real life room. Virus, on the other hand, seems exactly like a real-life room that was just copied into paper form. If the team behind Escape Room: The Game ever wanted to make a real room, I would be eager to play. Nuclear countdown is the third scenario you’ll find in the box. In this one, you play as a team of police officers who have received an urgent bomb threat, and you have one hour to locate and defuse the bomb before it explodes. The quality of the components in this scenario is decent but there’s still a little room for improvement. Some of the pieces are printed on high-quality glossy paper like you might find in a magazine, and while they look nice they feel slightly flimsy. Other components look like they could have been printed on a colour laser printer. Some thicker and more durable card stock might have helped the pieces feel a little more high quality. Still, they work well enough for what they’re supposed to do. The countdown timer is made out of sturdy plastic and works well. The red LED lights counting down the time are perfect for this scenario and really help sell the story. The countdown timer also provides some generic background ambient sound effects but they’re pretty forgettable. The game also has an app available for your mobile device which is supposed to play some background music to help set the scene. However, it was somewhat temperamental and we had trouble getting it to work and even when it did work the music wasn’t anything special. I’d suggest putting on your favourite action movie soundtrack instead. The puzzles in this scenario were quite good. There weren’t a whole lot of them, but the ones that were there were good quality and fun to solve. They also lent themselves well to teamwork, where multiple people could be working on solving a puzzle at the same time. Overall they were challenging and required some thinking without crossing the line into becoming obtuse and frustrating. This was one of the scenarios that took us the longest to solve, again not because the puzzles were necessarily hard but simply because there was a lot to figure out. The immersion was likewise decent. You’re given a fairly long story when you start the scenario to set the scene and establish the plot. Unfortunately, there’s not much by way of story development after that, but nevertheless the game still manages to be engaging. Everything you do along the way revolves around locating and then defusing the bomb, so you’re continually reminded of what’s going on. Plus as I mentioned before, the countdown timer ticking away while you work is a perfect fit for this scenario and adds just the right amount of tension as you worry whether you’ll get the bomb defused in time. And just to up the ante even further, you’re only allowed one attempt at solving the final puzzle – one wrong move and everything goes kaboom! Overall our team quite liked this scenario, and it was one of our favourites. The story, setting, and puzzles all come together to create a tense 60 minutes of scrambling to find answers before it’s too late. Definitely recommended. The ancient Aztec civilization is one that has interested me since I first learned of it. When I learned that one of the scenarios presented in Escape Room: The Game was set in an Aztec temple, I was most intrigued, and was very excited to play. The game components of Temple of the Aztec, as with much of what is offered in Escape Room: The Game, are paper. While this makes the packaging and storage of the game pieces easy, the durability of this game is quite low. Another downside is that after the initial manipulation of some of the puzzles and clues, the answers are likely to remain revealed for the next group who plays the game. On the upside, the game is very easy to prep on the first time around as the pieces pop out of storage without much hassle. The design and colouring of the game is brilliant, and is definitely inline with the theme. The Decoder is the triumph of Escape Room: The Game, offering a solid piece of technology coupled with numerous puzzle-solving tools. The puzzles fit the theme quite well. They become more difficult as the game progresses, and teams really have to work together to figure out the answers. We really enjoyed the progression of the puzzles until we hit the final task. We came up with a lot of theories for how to solve the final task, but in the end, any of our theories would have been more effective than the final solution. We all felt quite let down after experiencing the rest of the game. The puzzles integrate the Decoder in a variety of ways, which is great to see from a game that greatly relies on its only included piece of tech. Story is really what these escape room board games rely on when it comes to immersion. Obviously this is because there is no environment to become immersed in, so the stories really have to shine. Temple of the Aztec starts off with a lengthy introduction that really sets up the scenario that is about to begin. After this introduction, the story reappears in a couple of character-written items and progression information given after Part 1 is completed. After this, all you get is a now-you-have-to-escape message. To sum up: minimal story development. This may be because the clock is still counting-down while you are reading, however. There isn’t enough happening, in terms of puzzles, to entertain a large group. We suggest a group of two to attempt this experience in order to get the most out of immersion. As I mentioned, the “set” design is well done, and the puzzles are thematic, adding to the immersion of the group. As much as we would have liked to have seen more when it comes to our scoring categories, we did enjoy the game and had fun playing it. The hint system of Escape Room: The Game is quite ingenious, and they have made it very hard to accidentally read a clue. They have made the most of the Decoder and key system, and have made this one-time-play board game a fun experience. 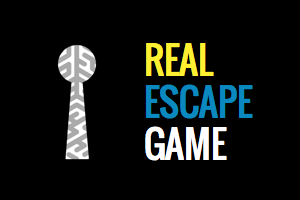 The game delivers the feeling of an escape room (without the obvious elements), and after playing one scenario players are left wanting more. …And there you have it! Four reviews each with their own strengths and weaknesses as seen from our different members who played Escape Room: The Game. How did we feel about the box collectively? For the most part people were a bit disappointed with the stories and immersion. With the exception of Nuclear Countdown, there wasn’t too much of an emotional connection or interest in what was happening, why it was happening, or how it added suspense to the adventure. Other disappointments were found in the quality of some components (e.g. very thin paper stock, or small print on items), and the repetitive nature of how each scenario played out (envelope #1, puzzles, then #2, puzzles, then #3 with puzzles that have the occasional leap in logic or fun). On the flip side, the Chrono-Decoder is REALLY fun to interact with! Nuclear Countdown was a very fun, engaging and creative scenario, and the puzzles include everyone in most of the scenarios, so it’s great for socializing and team building. We also felt this game allowed for a good ‘escape room experience’ if you’ve never been to one before. Would we recommend this game? …possibly. It depends on who you’re playing with. Escape room enthusiasts will be more prone to comparing the experience to actual escape rooms and therefore may not enjoy the lack of immersion or creative puzzles. Those who enjoy the escape room experience as a means of connecting with people in a team building and fun environment probably will enjoy this game because of its inclusive nature. Unfortunately like so many things in life we can’t give a definitive answer here as there was much debate among the ERA reviewers on what was more important.